Can my Windshield Cracks be Repaired? Can you repair crack in your windshield? It’s a common question, and thousands of drivers each year have cracks or chips on their windshields. Whether the windshield can be repaired depends on the extent of the damage: size and position of the crack, chip, or scratches or nicks. Combination Both types of damage combined. See Windshield crack types for visual comparisons of different types of window damage. CVA, or Critical Vision Area, is the area directly in front of the driver, approximately the width of the steering wheel. Cracks inside this area of the windshield can be repaired, but certain local windshield obstruction laws may prohibit repairs. You can never repair a windshield perfectly and a small disfigurement will always be visible. Repairing cracks in your windshield when inside the critical vision area requires the damage to be in a very small area. If the crack is in your critical vision area and directly obstructing your view of the road you may have to replace your windshield instead. As a general rule of thumb, most cracks under 6 inches in length can be repaired if they are not in the critical vision area or on the edge of the windshield. Should you repair your windshield or not? We always try to avoid costs and hassle, so many drivers are asking themselves whether it’s worth to repair windshields or just leave the damage be. There are several reasons why you should repair your windshield. Obstructed view: nearly all U.S. states have laws prohibiting driving while view of the road is obstructed in any way. Police officers are often looking for an excuse to cite you, and even in cases of small windscreen cracks they can potentially issue traffic tickets. Inspection: your car may also not pass inspection with a broken windshield. This depends on the state, location and extent of the cracks or chips. Damage can get worse: a small crack can quickly become larger. Driving over potholes or bumps can cause the initially small crack to enlarge, making it more difficult to repair afterwards. 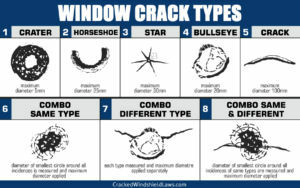 Cracks can also become larger due to atmospheric conditions: direct sunlight or frost. Safety: windshields are designed to withstand and prevent a lot of damage. In case of a frontal vehicle collision they can prevent front seat passengers from being ejected outside the vehicle. When windshield is cracked it is clearly not as strong. Furthermore windshield can prevent your roof from collapsing on your head in case of a rollover accident. Any cracks, nicks, chips, breaks, or even scratches can cause safety concerns for drivers, and should be repaired immediately. When your windshield gets damaged it is important to have it repaired as quickly as possible for two reasons. First. the damage may spread over time up to the point where repairs are more difficult, expensive, or even impossible. And second, dirt can get into the cracks which can make windshield repairs more difficult or more visible. Typical windshield repair job costs about $30 for a small crack. There are a ton of windshield repair shops that will take the job, some more professional than others. While windshield repair is not a difficult thing to do, some shops are just looking to make a quick buck. Make sure you read reviews and find a windshield repair facility that will do the job professionally. It’s not an expensive job so an extra $5 or $10 is worth to ensure your window repair is done properly. See our Windshield Repair Cost article for a more detailed breakdown of expenses. Alternatively you can purchase a DIY windshield repair kit and do the job yourself. DIY windshield repair kits are often below $10 and are easy to use, so if you have the time and patience you can do it yourself at home. In case of extensive damage to your windshield you may have to replace it completely. New windshield including the replacement job will cost you around $300 or more, depending on labor costs of your repair shop but also make and model of your vehicle. See our Windshield Replacement Costs page for a more in-depth breakdown of costs involved. Cost to replace a windshield is fairly expensive and if possible it’s always better to consult professionals first and see if the windshield can be repaired instead. Compared to full windscreen replacement, repairs are ten times cheaper and can produce great results. Tip: many shops will first offer to replace the windshield (they make more money that way). Make sure to specifically ask if your windshield can be repaired. Will car insurance cover windshield repair costs? Comprehensive car insurance or additional road hazard coverage in some states like Florida or Georgia requires your insurers to cover the cost of windshield repairs or replacement. Most people only have basic car insurance where any windshield repair expenses go out of your pocket. See: Can car insurance pay for windshield repairs or replacement? Your car insurance company will first have to determine if the windshield can be repaired. If the damage is extensive a full replacement may be required. Typically windshield replacement will not increase your insurance premiums, but check with your insurance company first to ensure that is the case.